In a lucrative industry like HVAC, new customers mean money. A single HVAC job may bring your company upwards of $10,000—and that’s just the initial installation. A new HVAC customer who is happy with the service you’ve provided can turn into a loyal client that needs regular maintenance and repair jobs in the future. Generating leads is only one part of the HVAC sales equation. HVAC sales are the most crucial part of the business journey, but the real challenge is turning your leads into paying clients. 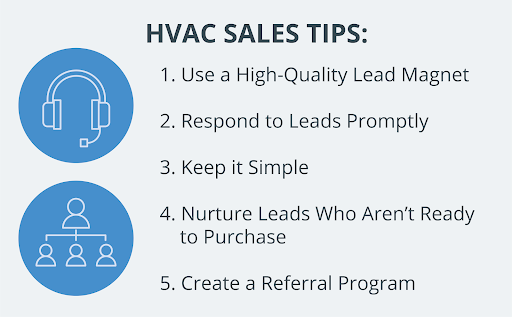 Have a look at our favorite HVAC sales tips on how to gain more business by transforming leads into customers. Housecall Pro is the all-in-one software to manage and grow your HVAC business. Joining Housecall Pro also gives you access to a whole HVAC community to help you with any HVAC questions. Start free 14 day trial now. 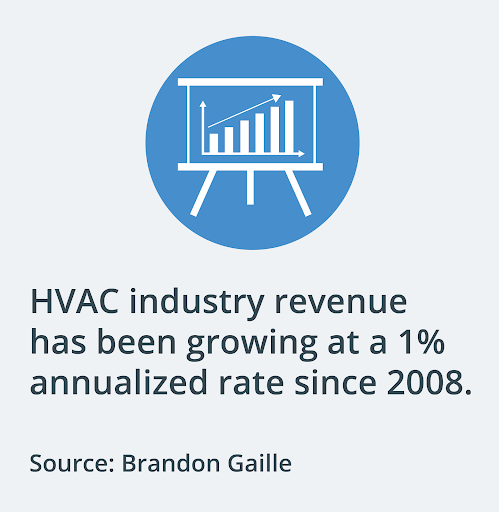 There’s plenty of leads to profit on within the HVAC industry; revenue has been growing steadily at a 1% annualized rate since 2008. What’s that mean? There’s plenty of money to be made in this field. Every salesman knows that a high-quality customer begins with a high-quality lead. Chasing down lead after lead can get tiring, especially when you may find that the potential customer isn’t qualified for or in need of your services. That’s why it’s so important to develop a high-quality lead magnet. This is a tool that attracts customers who are ripe for selling - meaning you can waste less time with those who aren’t. A lead magnet is a piece of information that you can give to a potential lead in exchange for their contact information. It’s a simple way to quickly grow your HVAC business. Creating a high-quality lead magnet is an HVAC sales technique that attracts and pre-qualifies your leads. It should provide information about a topic within your field and give you the opportunity to plug your services. In essence, it should ensure that whoever is giving you their information in exchange for your content is someone who requires your services. All of the above lead magnet examples ensure that the user either has an HVAC unit or is considering an HVAC unit—perfect for a potential client. Distributing your lead magnet is easy. Consider the most common places someone might look for your HVAC unit. Your company website or blog is the perfect place to post your content. Make sure to set your page up to require contact information (ideally, a name and email address) prior to downloading the lead magnet. For those who may be searching offline, consider advertising your material in your local Yellow Pages or any other print publication you might advertise in. Old school? Yes. However, reaching a wider audience may be the key to growing your business. Once you’ve got your lead magnet pulling in a steady stream of leads, it’s vital to respond to leads promptly. While it may seem like an HVAC sales no-brainer, the difference between a day-of and a next-day response could mean the difference between a new client and a missed opportunity. Consider this: it’s the dead of winter and someone’s heating unit just stopped working. Freezing temperatures have them desperate for a unit repair ASAP, so they contact a handful of different HVAC companies. If you’re the first to respond, chances are that you’ve landed the job. A single unit repair call could turn into an entirely new heating and air conditioning unit and a lifelong customer. What if you can’t get back to those leads quick enough? If you simply aren’t capable of responding right away, give leads an idea of when they can expect a response from you. That may come in the form of a confirmation email or voicemail message that lets the inquirer know you’ll be in touch within 24 hours. Another pro tip is to direct callers to your online booking system within your voicemail message. That way, even if you can’t come to the phone, you can still convert your HVAC lead to a customer. If there’s one thing that all humans share, it’s that we gravitate towards things that are easy. We prefer simple processes over complex ones and are deterred by things we feel are unreasonably complicated. This HVAC sales technique appeals to that tendency: keeping it simple. Make it as easy as possible for potential customers to use your services. That means putting the least number of steps between the potential customer and yourself so that booking your service is a breeze. First, post your contact information prominently and clearly on your website and in your advertisements. 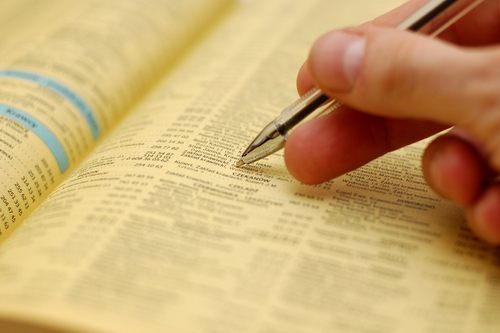 Be sure to build a presence on common directories like Yelp, Angie’s List, and Yellow Pages. Include all pertinent information, including your hours of operation, the services you provide, and other details. Next, simplify your booking and payment services, so that potential customers can easily lock down and pay for an appointment with you. Old school processes like paper invoicing are painfully slow and easily misplaced, resulting in a potentially poor client experience. An easy way to do this is with HVAC software. Moving your business processes to an HVAC software not only streamlines your scheduling, paperwork, invoicing, and marketing strategies, but it also makes using your services simpler for your clients. With Housecall Pro, your clients can also book your services digitally. You can even set up an integration with Yelp so that your clients can book right through the app. Not only does this HVAC sales platform make the process easier for your customers, but it also frees up your time, so that you can focus on expanding your business. When it’s time to pay, Housecall Pro lets you invoice your clients digitally and allows them to pay for your services online. When a customer pays for your invoice, Housecall Pro’s Instapay feature allows you to deposit credit card payments into your bank account instantly so that you’ll have the money in 30 minutes or less. As an added bonus, Housecall Pro’s dispatch updates allow you to keep your clients up to date as soon as a technician is dispatched to service them, minimizing the dreaded, lengthy service window and winning you a happy customer. In a highly competitive, high-cost market like HVAC sales, a potential customer looking for a costly service is sure to do their research. That means reading company reviews, researching units, and price shopping installation costs. A customer in the market for ductwork or a new heating and air conditioning unit may contact several different companies to get a lay of the land before they commit. If your lead isn’t ready to commit, the biggest mistake you can make is to let them go. With a well-designed lead magnet, it’s easy to maintain a relationship with a lead who isn’t ready to buy. 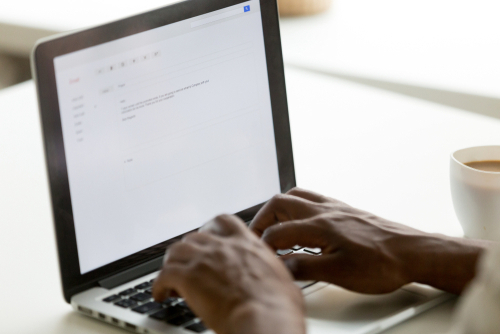 If you’ve developed your lead magnet correctly, you now have the contact information of someone who has a high potential of needing your services. Now, it’s your job to prove to them that you’re the one to choose. One of the most effective ways to do this is with an email campaign. This may take the form of a monthly newsletter, a seasonal maintenance reminder, or a regular promotional offer. The goal is to position yourself as an expert in the field so that potential customers who are still in the research phase will see you as the best choice for their needs. Potential customers have many resources for reviews these days, from Angie’s List and Yelp to BBB recommendations. But there’s no review as trustworthy as that of a friend or family member. A customer who’s happy with your services is likely to have an abundance of friends and family who need the same help. That’s why a referral program is one of our favorite HVAC sales training tips. Don’t believe us? 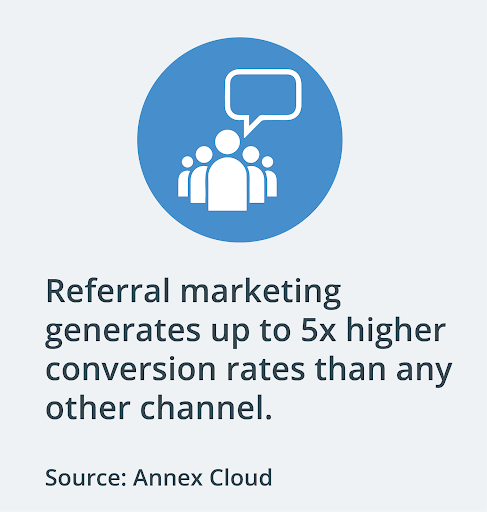 Here’s proof: Referral marketing generates 3-5x higher conversion rates than any other channel. Time is money, and taking time away to market your business means less time for you to service customers. Rather than putting your own time aside to find new clients, what if you could employ your wealth of happy customers to do it for you? A referral program does exactly that. A strong referral program offers an incentive to both the referrer and the referred. For instance, you can offer your existing customer a discount on a future service for a referral on a new installation, as well as the referred customer a discount on their new installation, service, or repair. As long as you provide tip-top services and an excellent customer experience, you’ll have clients spreading the word in no time! There are a wealth of HVAC sales training tips for driving a steady flow of leads, but that’s only half the equation. With the above HVAC sales tips, you’ll be turning your leads into a wealth of happy customers.